This is a powerful life changing Manifesting Experience which you’ll receive 12 Manifesting Meditations on MP3 Audio, the 8 Day Manifesting E-course, the 90 Day Manifesting Routine, and Jafree’s Golden Manifesting Money Technique! These manifesting meditations and backbone to the manifesting program are powerful enlightening experiences will truly transform the way that you experience life! Manifesting meditations are the most powerful tools for attracting your heart’s desires. You can completely reprogram your mind to receive financial freedom, have enlightened relationships, maintain perfect health, self-love, connect with your soul mate and have a variety of spiritually enlightening experiences along the way! These high vibrational audio journeys come with The 8 Day Manifesting E-course which when used together create a powerful vehicle to shape-shift your attitude, vibration, and your reality. By instantly downloading this package today you’ll begin to awaken and activate the manifesting power within you. The best way to transform your outer world is by shifting your inner world. The positive imagery created in your subconscious mind results in positive emotions that will magnetize your desires to you! Each meditation journeys comes with trance-like background music that helps you relax into your body and open up your energy centers. Say goodbye to those negative thinking patterns for they will be reprogrammed with positive thoughts and feelings of abundance and true mastery of your mind! Since 1999, I have done extensive research on the science of manifesting over the past 1500 years. I’ve tested this research on my clients and my own life, and have discovered the essential secret information needed to manifest anything! 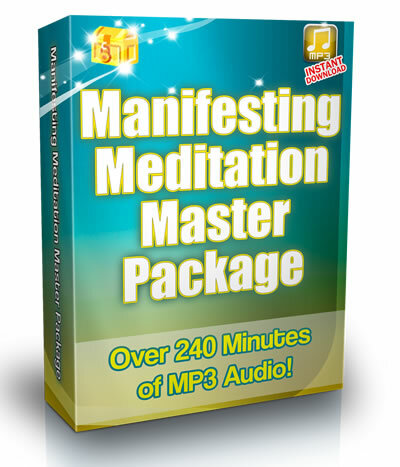 This Master package contains everything you need to re-program your life for success! I have personally designed this package to be affordable so anyone can access all 12 manifesting meditations and empower their life in miraculous ways. By downloading this package today you are signing up to become a powerful Manifesting Master and learn how to truly master your mind and your life. Enjoy! Your Meditation Master Package contains ALL 12 AMAZING Manifesting Meditations, the 90 Day Manifesting Routine and Jafree’s Magical Manifesting Money Technique! Jafree’s Golden Manifesting Money Technique This short 6-page ebook contains the golden essential components to becoming a Manifesting Money Magnet. You’ll quickly learn Jafree’s secret technique to increasing your Financial Frequency and attracting any specific amount of money into your life. This is a powerful manifesting technology that will transform your relationship with manifesting money on the deepest levels. The Blue Room Manifesting Meditation (23 minutes) This world famous revolutionary experience takes you into a conscious dream-like state where you actually step into the most powerful manifesting place in the Universe…The Blue Room! The power you’ll receive from this manifesting vortex is unbelievable. You can create real-life agreements that manifest themselves back on Earth! Perhaps you would like to improve a relationship, meet your life partner, create a new financial contract, or simply manifest more business. By meeting with people in this Blue Room you’ll soon see how the manifesting magic effortlessly starts unfolding into your life! The Guided Meditation to Become a Manifesting Magnet (20 minutes) This meditation will skyrocket your body’s manifesting vibration so that you can quickly and effortlessly attract whatever you desire into your life. You will deepen your ability to trust yourself and the Universe, and connect with your natural ability to manifest! In this meditation, you will be sending out so many positively charged vibrations that your every desire will be miraculously magnetized to you! Guided Meditation for Manifesting an Abundance of Money (18 minutes) This meditation will dramatically heal and empower your relationship with money! You will go on a journey that releases negative limiting beliefs holding you back from manifesting abundance into your life, and submerge your mind-body with a powerful NEW state of abundance consciousness! You will literally FEEL like a million dollars after you’re done with this meditation! The Manifesting Money Mantra Meditation (25 minutes) This powerful audio meditation will dramatically boost your ability to attract a consistent flow of financial abundance to you. This meditation will reprogram your mind with 38 powerful money mantras which are proven to dramatically boost your ability to attract wealth into your bank account! Each time you listen to this meditation, you will reawaken the feeling of abundance consciousness and attract those financial goodies to you! The Guided Meditation to Meeting Your Financial Guru (19 minutes) This guided journey will support you in uncovering your natural financial wisdom and teach you how to manifest prosperity into your life. Receive specific guidance from your inner financial guru which will dramatically increase your sense of confidence and financial direction. Your inner financial guru will be able to answer your toughest questions about mastering your current financial situation, and give you a step-by-step plan on HOW you can manifest more income this week! The Guided Meditation for Manifesting Your Soul Mate (30 minutes) This enlightening manifesting meditation will help you to physically attract your soul mate into your life. And, if you are already in a relationship, it will create a deeper loving soul connection with the person you are with! Even listening to this meditation one time can heal your heart from past wounds and allow you to open up to experience deeper intimacy in any relationship. The Guided Meditation for Experiencing Samadhi (30 minutes) This enlightening experience takes you directly to the highest state of consciousness. You will go on a journey that takes you beyond the mind and body, into experiencing Divine Presence and deep inner peace. When you arrive at this deep place of silence and connection with your divine spiritual essence, you will experience a dramatic shift in your ability to manifest more of what you desire. Within this higher vibrational state, you cannot experience any more suffering, you’ll only be seeing life clearly and feeling more expansive on every level. Guided Meditation for Awakening Your Kundalini (25 minutes) This guided meditation gently opens up your Chakras (energy centers) so that one day you will experience a joyful Kundalini awakening! The exploration and opening of these Chakras will help you to know the divine all-powerful spiritual being you truly are. The more you practice opening up these Chakras the easier it becomes to manifest exactly what your heart desires. You’ll be gently awakening the most powerful healing and manifesting energy on the planet! The Kundalini is sleeping inside you, and when it is awakened, you will experience the Divine within everyone and everything. Guided Meditation for Healing your Body, Mind, and Soul (23 minutes) This guided meditation is designed to support you in manifesting a full physical mind-body healing by transforming the vibrations within every cell of your body. Other benefits of listening to this meditation daily can include relief from physical pain, deeper levels of inner peace, an increased amount of energy, and the quieting of excessive mind chatter. The Self Love Meditation (25 minutes) Loving and accepting yourself exactly as you are is the greatest secret to consciously attracting more love, abundance and success. This life transformational experience will increase your natural manifesting ability through LOVE! You will be able to easily and effortlessly RECEIVE those needs and wants you previously did not feel worthy of. Rejuvenate and heal yourself on the deepest levels as you discover the greatest secrets in the world to embracing and loving yourself. Guided Journey into The Akashic Records (30 minutes) This guided spiritual journey provides a new perspective and paradigm shift for a deeper understanding of yourself and your life. This is a journey of self-discovery where you’ll get to view past lives and receive valuable life-changing information stored in your soul’s Akashic Records. You’ll ignite a deeper awareness within you that will eliminate any painful illusions that have been previously running the show. The Magic Manifesting Mantra This meditation will open your heart, quiet your mind, and help you to relax into your innermost being. This experience will shift your vibration so that you are extremely receptive to letting your desired manifestation come to you! The power this little meditation has is outrageous and can transform your life in amazing ways. The 8 Day Manifesting Magnet E-course will “jumpstart” your manifesting vibration by teaching you the essential secrets to manifesting your heart’s desires. You will receive 8 powerful manifesting lessons via EMAIL over 8 consecutive days. Each message contains an ancient manifesting secret as well as the practical knowledge on how to apply and implement this empowering information. These manifesting “homework assignments” will inspire you and get you into action! You’ll find yourself easily manifesting amazing relationships, financial freedom, unstoppable confidence and much much more! The 90 Day Manifesting Routine This is the essential backbone to raising your manifesting vibration and tapping into your natural power to attract anything you desire in life. It will teach you how to easily and effortlessly manifest more money, a better relationship, peak energy, optimum health and greater confidence in yourself. By following this routine for 90 days you are guaranteed to create massive results in your life! This is a super sweet summary of the entire 90 Day Manifesting Routine which is Chapter 9 of the Manifesting Manual. Simply follow this routine for 90 days while doing the Manifesting Meditations and your life will transform… FOREVER! !